If you’re looking for a new companion, this glittery unicorn is sure to make a wonderful cuddly friend. 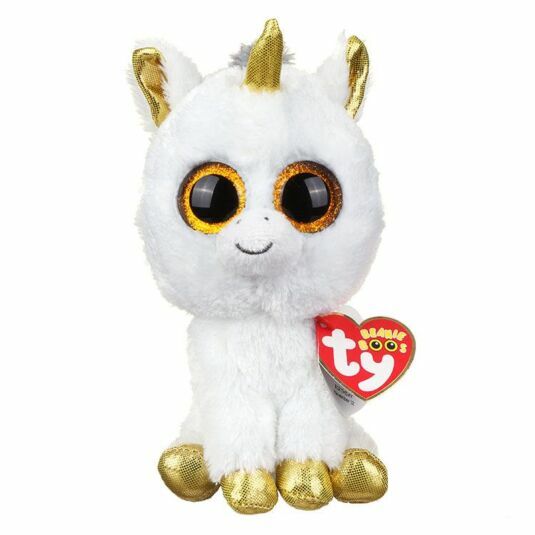 This Beanie Boo from Ty has been named Pegasus, and she has soft white fur, and her feet, horns, ears, and eyes sparkle with magical gold. These bright colours make it hard to hide at night! Please remove all tags before giving the item to a child, and in order to care for your Beanie Boo, Ty recommends hand washing. Beanie Boos are the new craze from Ty. Not only do these lovable critters have super soft fur, they have beautiful big eyes that no-one can resist. With dozens to choose from, all with an adoring look that says ‘Come and cuddle me’, you’ll want to collect the whole set! Ty International is a major manufacturer of soft toys and beanie toys, most famous for the Beanie Baby craze which swept first America and then the world in the 1990s. Temptation Gifts are proud to have been a major retailer of Beanie Babies during those years, and our high street stores have been credited by many in the gift industry as having been one of the key factors behind the explosion of the craze in the UK.